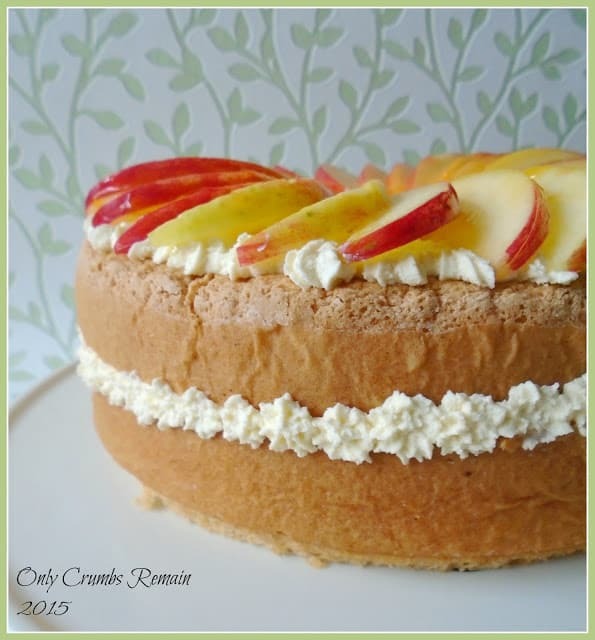 A delicious and light Genoise sponge cake, filled with cream and an apple & cinnamon compote made the perfect birthday cake to celebrate mum’s birthday. For the flavours, I knew I didn’t want to use chocolate because of the fact that it can be a little rich and would possible be too much after eating out. 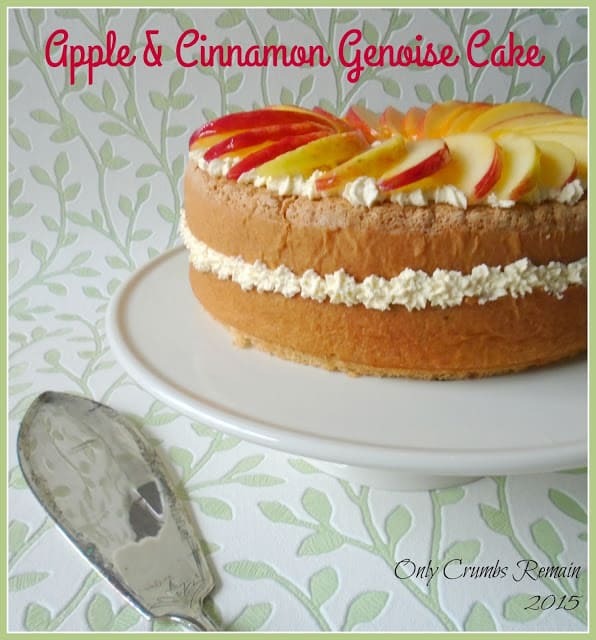 I was inspired by the ‘Cinnamon and Apple Gateau’ found in one of my numerous baking books, Cakes and Cake Decorating. After all, it’s perfectly seasonal given that our humble British apple is in the shops now. The cake was split in half and filled with a cream cheese mixture and an apple and cinnamon compote. The top was then adorned with chantilly cream rosettes and finished with slices of apples glazed with apricot jam. I made the sponge with gluten free flour given the results of a mini experiment I conducted when looking at flour in Victoria sponge cupcakes, and we found the cake to be beautifully light as expected. The lightly spiced apple compote cut through the creaminess of the frosting and chantilly cream a treat. It was simply lovely. 1. Pre-heat the oven to 200c / Fan 180c / Gas 6. 2. Prepare the cake tin. Grease the insides of the cake tin thoroughly and line the base with greaseproof paper. Place the teaspoon of flour into the greased cake tin and, holding it on its side and over the sink, tap the cake tin so that the flour adheres to the greased sides of the tin. Knock out any excess flour. 3. Weigh the cake ingredients. Have all of your cake ingredients ready as you need to work swiftly once the batter has been beaten to help reduce the loss of volume. Sieve the flour 3 times. Fold a tea towl into quarters and place on the work surface. 4. Melt the butter. Place the butter into a small pan and set over a low heat to slowly melt. Remove from the heat once it has melted and set aside. 5. Make the sponge. Add some water to the pan so that it is no more than a quarter full. Break the eggs into a large glass bowl and suspend this bowl over the pan. Ensure the water in the pan doesn’t touch the bowl. Place the pan over a low heat on the hob. Using the electric beaters (or balloon whisk if you’re feeling energetic) lightly whisk the eggs. Add the two sugars and continue beating on a medium setting for about 7 minutes. The egg mixture will initially be frothy, but will gradually become thicker the longer the mixture is beaten. You’re aiming for ribbon stage. This is where the mixture leaves a trail on the surface when the beaters are lifted. You should be able to write the number 8 without the ribbon sinking into the mixture until the number has been completed. 6. Fold in the flour and butter. Remove the bowl from the pan and sit it on the tea towel. Pour the butter down the side of the bowl into the mixture so that it’s not landing directly onto the top of the aerated batter. Sieve the flour into the mixture. Using a spatula or large metal spoon start to gently fold the flour and butter into the mixture. Ensure you get to the bottom of the bowl where flour can become trapped. Avoid over working the mixture. The batter will deflate a little during this process, but do aim to work gently yet speedily. 7. Fill the cake tin. Pour the batter into the prepared cake tin from a low height. 8. Bake. Place the cake tin in the centre of the oven and bake for about 25 minutes. You may need to rotate the tin after 20 minutes of baking. Once baked, remove from the oven and place on a cooling tray. Remove the sponge from the cake tin after a couple of minutes and allow to fully cool. 9. Make the compote. While the cake is baking make the apple compote. Peel, core and chop the apples. Place into a pan with the honey and water. Set over a medium heat and allow to cook stirring periodically with a wooden spoon. After about 10 minutes, the apples will have broken down. Add the sultanas and ground cinnamon. Stir again and cook for a further 2 minutes. Pour into a bowl and set aside to cool. 10. Prepare the apricot jam. Place 2 dessert spoons of apricot jam into a small pan with one spoon of water. Set over a low heat allowing the jam to loosen. Stir thoroughly to mix it with the water. Pour into a bowl and set aside. 11. Prepare the cream cheese filling. 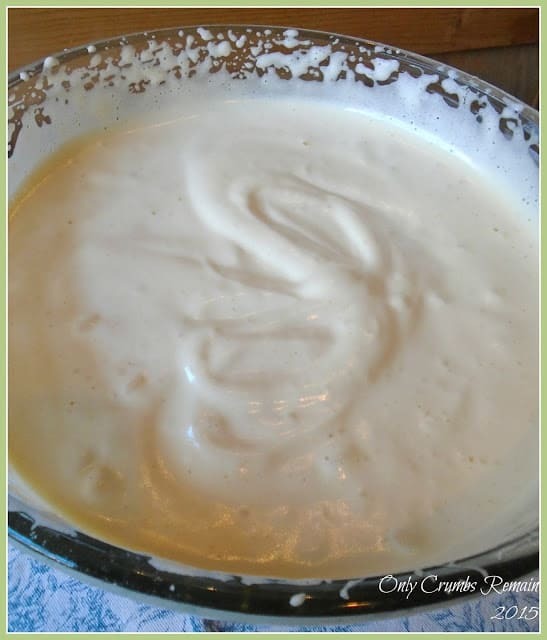 Place the cream cheese, fromage frais, honey and lemon juice into a bowl and whisk together until well combined. Avoid over mixing. Set aside. 12. Prepare the chantilly cream. Pour the cream into another bowl. Using a balloon whisk beat the cream until it has reached soft peak stage. Add the icing sugar and vanilla extract and stir together, avoid over beating it. 13. Assemble the cake. Once the cake is fully cold place it onto the board / stand you want to serve it on. Use a serrated bread knife to cut the cake in half horizontally. Carefully set the top half aside. Spoon the cream cheese mixture onto the cut surface of the cake and spread it out almost to the edge with a pallet knife or back of a spoon. Using a spoon distribute the apple compote over the top of the cream cheese frosting. Level it out with the pallet knife or back of a spoon. Place the top half of the cake onto the filled base, ideally in the same orientation that it was removed. Fit the piping bag with a star nozzle and fill with the chantilly cream. Starting in the centre of the cake pipe rosettes to the top surface. Continue until the whole of the top of the cake is covered. Pipe rosettes along the cut seam of the cake. Squeeze the lemon juice into a bowl. With a paring knife, or similar, core and thinly slice the remaining eating apple. Toss the apple slices in lemon juice to prevent them from browning. Arrange the slices to the top of the cake. Using a pastry brush, lightly coat the apple slices with a little of the loosened apricot jam. What a lovely cake, It does look very light and has risen really well. I would love a slice! Apple and cinnamon are perfect for the time of year, in fact I just used the same combination yesterday as well. Thank you for linking up with Perfecting Patisserie Angela! Thank you Lucy 🙂 I was really pleased with how well it came out, it ate really well too given by how quiet we were once we sliced into it. Apple and cinnamon is such a classic combo, and a particularly favourite one of so many, as well as us. That's beautiful. My only attempt at genoise was not a success and was many years ago but maybe I should have another try! Thank you for the kind comment Janice. Definitely have another go, I always find I learn quite a lot from my failures – like the biscuits I made yesterday! Definitely give a genoise a go – what's the worst that can happen? And if it does, then it'll still be great smothered in custard 🙂 All joking aside, it's not too different to a swiss roll sponge. The cinnamon is a spice I use quite frequently, I just love it and with the apple it's just delicious. Thanks for popping by and commenting, and for hosting of course. ooh you'll have to give it a go Rebecca, it's not that much different to making a swiss roll sponge. The fruit was really tasty especially with that touch of cinnamon. Thank you Sarah, we all really enjoyed it and there wasn't a peep out of us as we devoured it! The 'Hen Goose or Turkey' hair pulling birthday game has really become quite a family tradition now over the yrs. We even do it over the telephone if we're unable to see the birthday girl or boy!